You’ve been asking me for a list of my favorite recipes. Why? Because apparently you know that in addition to the role of contributor, husband, web developer, crisis manager, bookkeeper and defender, I also am blessed to be the official Humorous Homemaking taste tester. It is one of my most difficult assignments, having to sample everything that comes out of Stacy’s kitchen. You may think I’m being sarcastic here, but you can only imagine how difficult it is to maintain a girlish waistline when presented with some new delicacy almost daily. I have a real challenge on my hands! All kidding aside, when we asked in a survey late last year what you’d like to see from me, several of you wanted to know my favorites. Many of you admitted it is because you want to make these for your man, but I suspect it is because each of you want to make these for me and present them as a tribute for my expert taste buds to judge the quality of your ingredients and the skill with which you combined them to a final product. No matter the reason, you asked. So here you go. 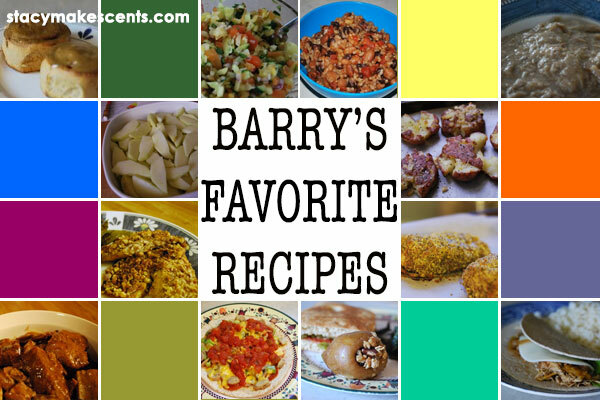 I went through the various archives of Stacy’s recipes and picked out my 35 favorites. I skipped all those that require you to buy a book or subscribe to something…although you should definitely consider picking up a copy of one of Stacy’s cookboks since one of my TRUE FAVORITE OF ALL TIME recipes is in one of them (Double Chocolate Peanut Butter Lava Cake, anyone?). Those are my 35 favorites…what are YOURS? Great group of recipes! The Doughnut Scones sound especially good. Thank you for linking to the In and Out of the Kitchen Link Party. Hope to see you next time. Hey Barry, Why are there more dessert listed than anything? LOL. I had to notice that not that I am complaining! Thanks!